Just like Christmas in western countries, Chinese New Year, or known as Chinese Spring Festival, is the most important festival for Chinese people. It is really loved by both old and young and it is the most happy festival of year. Chinese New Year is 15-day long, with lots of preparations starting long ahead of time. Chinese New Year is based on the lunar calendar hence each year the Chinese New Year will be a different day. The festival has various celebrations and traditions, which could be dated back to the prehistoric era. This is a reunion time for friends and family and every year, regardless of where they are living, every family member return to their home town to celebrate with their family. 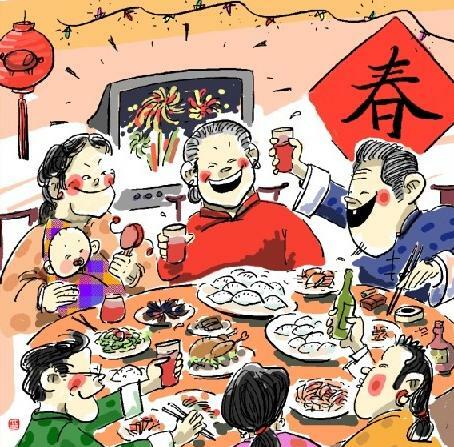 On the eve of Chinese New Year, each family in China will hold a huge family gathering dinner. Despite their work and studies outside. family members are anticipated to go back home for Chinese New Year and to have this most important dinner of the year. This is a big meal, where lots of fantastic dishes can be found including: chicken, fish, pork, Chinese dumplings and a lot of special desserts. Ancestral worship has been in important part of festivals since prehistoric times and it is especially true during the Chinese New Year. It is at this time that all Chinese pay respect to their ancestors and thank them for everything they had done for the current generations. 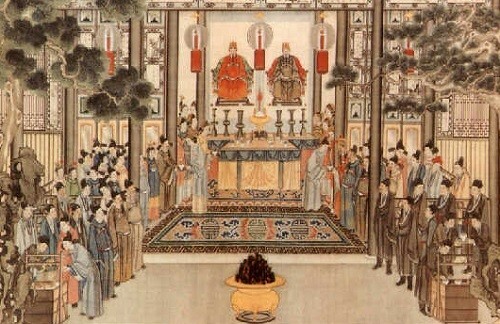 Traditionally in China homes, property, possessions, and land were passed down from generation to generation and current generations wish to pay respect and give thanks to the preceding generations for their hard work to establish their homes and families. They do that by going to visit their ancestor’s graves and paying respects. On the first day of the Chinese New Year, many families spend hours preparing food, which they will take to their ancestor’s graves. Once at the graves, they will clean them; offer the food, as well as cigarettes and alcohol. Incense is burnt at the grave by each family member and fireworks are lit to scare away any evil spirits in the area that might bother their ancestors. This process is repeated until all of the ancestor’s graves have been visited. The food is then taken back to their homes and a huge feast ensues. In most homes, especially in the countryside, photos of deceased relatives are hung in the main room of each house. Every month, the photos are taken down to be cleaned, incense is burned, and food is offered. 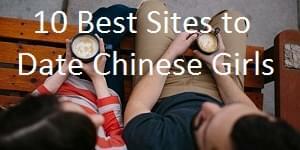 Ancestral worship plays an integral part of most Chinese people’s lives. 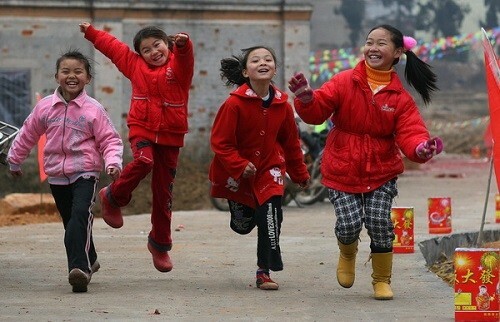 Hongbao, or Red Envelopes, are perhaps the favorite part of China’s New Year’s festivities, especially with children. As the name suggests, Hongbao consist of a small red envelope covered with Chinese New Year designs and usually sealed with a golden sticker. Money is put inside the envelope which is then given to children. Hongbao are used year round for weddings, funerals, as gifts, and as housewarming gifts, but it is during the Chinese New Year that they are most prevalent. The money inside the Hongbao follows strict guidelines. Traditionally an amount that is a double number is put in, or a number with auspicious meanings like 6, 8, or 9. 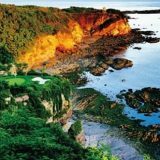 Up until recently, the money was a small amount, but in recent years the amount has grown considerably. The red envelopes are given by the adults to the children of their friends and family. 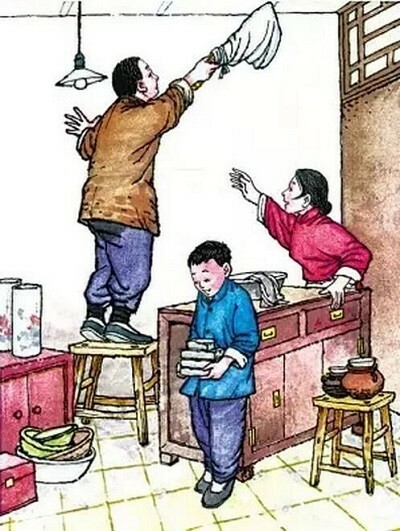 On the first and second day of Chinese New Year’s, children receive Hongbao, but are not allowed to go out, so on the third day, when they are finally allowed out, the children go out on shopping sprees. As most people know, fireworks were invented in China. Originally used in military applications, it was soon adapted by the locals and became an essential part of China’s New Year. According to legends in ancient times there was a monster named Nian who came down from the mountains each year to devour livestock and the local populace. It was discovered that the color red, bright lights, and loud noises scared him, so the locals hung red couplets and lanterns on their houses, had large bonfires, and lit off fireworks to keep him away from their villages. Approximately one month before Chinese New Year small fireworks shops open everywhere in preparation. Each family tries to outdo each other in terms of size and scale. 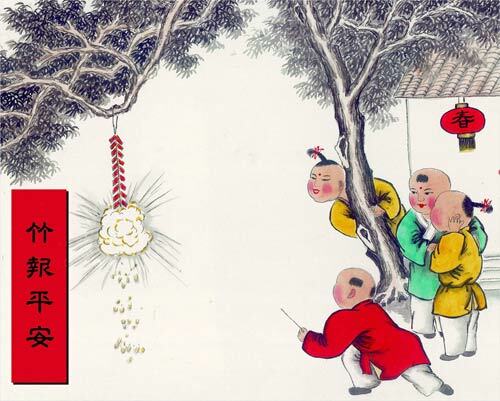 On Chinese New Year’s Eve, the occasional bang of fireworks can be heard, lit by people who can’t resist the temptation. Just before midnight all of the family’s fireworks are taken outside and lit. First comes long strings consisting of hundreds, or even thousands of firecrackers are lit, followed by fireworks of every description. Every part of China sounds like a warzone and it goes on for hours. It is a very exciting time for all. One of the most important aspects, although perhaps not the most enjoyable, of China’s New Year’s Festivities is the annual House Cleaning. Beginning early in the morning, all of the furniture in each family’s house is covered with sheets before the walls and ceilings are swept down with brooms. Then the entire house is scrubbed clean. Furniture is moved about to make sure each corner of the house is thoroughly cleaned. This tradition’s motives are multifold. 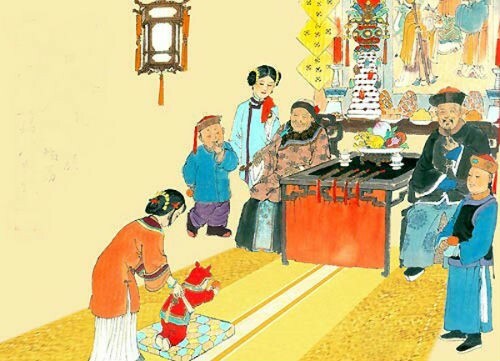 Besides making the house spotless for the Chinese New Year’s festivities, it is believed that it will ensure that the new year is a clean and healthy one. No cleaning, especially sweeping and removing of trash from the house, is allowed on the first day of the near year because it is believed that it will sweep out any good luck for the following year. 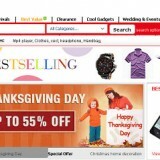 Each year, for the Chinese New Year, each Chinese person purchases new clothing. It is considered to be very important to wear new clothing for the new year because it symbolizes a fresh new beginning to a new year and the hope that they will have a prosperous new year with plenty of money to buy necessities such as clothing. Traditionally red clothing is worn on Chinese New Year’s because the color red is considered lucky in China. It also reflects back on the origin legends of Chinese New Year. According to legend, in the ancient past a monster would come out each New Year’s Day to devour livestock and people. It was discovered that the monster was afraid of the color red, so red Couplets were put on houses, and everyone wore red on New Year’s Day, and the tradition continues to this day. Chinese New Year, the most important festival in the Chinese calendar, is a time for family and friends. When distance or business kept family members apart, New Year’s Greeting were sent in the form of a card which would be mailed early so that it had plenty of time to arrive before Chinese New Year. In recent years, with the prevalence of mobile phones, the Chinese New Year’s Greeting Cards have all but been abandoned. New Year’s Greetings are now sent via mobile phone messages. On average, each person in China receives hundreds of messages wishing them health and prosperity in the year ahead. On the second day of Chinese New Year, each family goes to visit the wife’s family. Chinese New Year’s Eve, and New Year’s Day is spent at the family of the husband’s family. Each family spends many hours preparing food for the visit and a huge feast is always the result. The visiting families bring fruits, alcohol, and cigarettes to their in-laws. The children of the family are given Hongbao (Red Envelopes), which are filled with money. 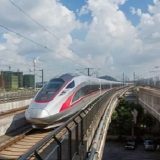 It is a wonderful time for relatives to get together and since almost every Chinese person returns home for the Chinese New Year, it is a great chance to meet with family members who might live in different parts of China and are rarely seen. On the second day of Chinese New Year families go out to visit their friends, and family. Traditionally the family first goes to visit the wife’s family because New Year’s Day is spent with the husband’s family. Each family going out to visit friends and family take with them many gifts and are treated to many gifts when arriving. When visiting, fruit, alcohol, and cigarettes are given. Each home has many fruits and sweets prepared for visitors. After visiting the wife’s family, friends are visited. 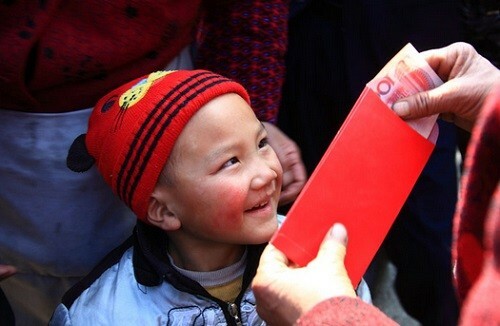 Children are given Hongbao (Red Envelopes), which contain money. They are given to the children of each family that they visit. This is always the children’s favorite part of the Chinese New Year. It is a great time to wish each person luck, joy, and abundance in the New Year. The fifteenth day of the first lunar month is the last day of the Chinese New Year Festival. But it is not just the last day of the festival, the day is also a very important festival called Lantern Festival. 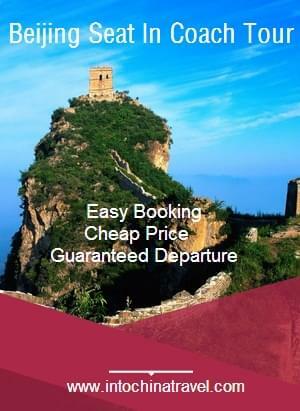 During the day, people in southern China will enjoy lion dances and those in northern China see various “Yangge” including dancing, and performing acrobatics performances. In the evening, family members will eat Yuanxiao, a kind of ball dumplings made of small glutinous rice flour balls stuffed with sweet things. 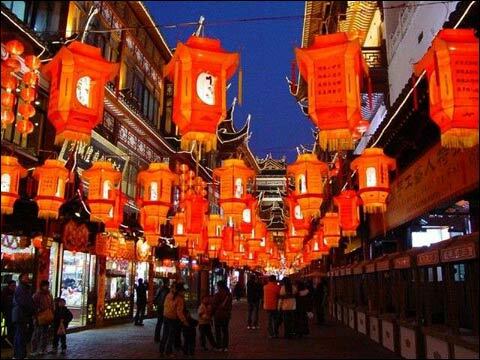 Many places like parks, walking streets, squares and ancient towns will display a variety of brilliant and gorgeous lanterns together with various performances. After dinner families will go out and enjoy the various colorful lanterns.